A masterpiece out of Russia. 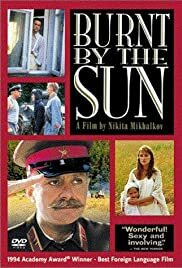 "Burnt by the Sun" glides effortlessly, seamlessly though the genres as it tells of a handful of Russian characters who collectively constitute a family of sorts with great humor and drama, poignant and sweetly sentimental moments, and excellence both technically and artistically. What is more, the film's story is interesting, unpredictable, and well told with depth and thoroughly developed characters. The much which has been written about the politics of the our time, the Oscar award and the bravura with which it was accepted, etc. is much ado about nothing. This is a movie. This is art and entertainment. And, when taken for what it is, "Burnt by the Sun" is truly a masterpiece.